An experienced team have introduced an international project to support entrepreneurship and the community development objectives of the Commonwealth. The CED project focuses on finding, educating and supporting aspiring entrepreneurs in each of the 52 Commonwealth countries. It is especially important in countries with disadvantaged and vulnerable communities, because it encourages skill development and it empowers communities to meet their daily challenges by taking practical action, which results in an improved quality of life. The project has two mutually reinforcing constituents: The first being to build and encourage entrepreneurship, equipping new entrepreneurs with skills to build long lasting businesses and the second to ensure that all start-up businesses produce a positive and long-term beneficial effect on the local community. Launching the project with a visit to the Kenyan High Commission, Nwes CEO, Kevin Horne, donated Commonwealth flags to eight schools in the Kisii County of Kenya, which is acting as a pilot country for the project. Received by Minister Counsellor II, Grace W. Cerere, the flags mark the start of an exciting journey for one aspiring entrepreneur from South West Kenya. Supported by Nwes, Violet Adhiambo has started her Kenyan business, which is introducing a female sexual health program to eight schools in the Kisii County. Many Kenyan girls are uneducated on the facts of menstruation, puberty and reproductive health and this, together with cultural myths, can lead to embarrassment and low self-esteem. In many households the subject of menstruation is considered strictly taboo. These myths which have been passed down from generation to generation hold very little knowledge about the actual biological process of menstruation. This lack of factual information, often results in the girls’ practical needs related to managing their menstruation, not being appropriately addressed. Many of the girls are also not in a position to afford sanitary towels, so in order to avoid the embarrassment of soiled clothes, they find inappropriate methods to manage their menstruation, such as the use of tissue paper, newspaper or even torn pieces of mattress, or in most cases they stay away from school for days at a time. Part of Violet’s curriculum incorporates educating the girls about menstruation, raising awareness about HIV and the importance of disease prevention. Our aim is to educate these female pupils, so that we can reduce absenteeism and increase academic performance resulting in more opportunities for African girls. The CED project will soon begin a sponsorship drive, with the hope that UK businesses will help us acquire the product that these young girls so desperately need. Dovetailing with Fly a Flag for the Commonwealth, the CED project also aims to highlight the benefits and shared visions, which are a result of being part of the Commonwealth. 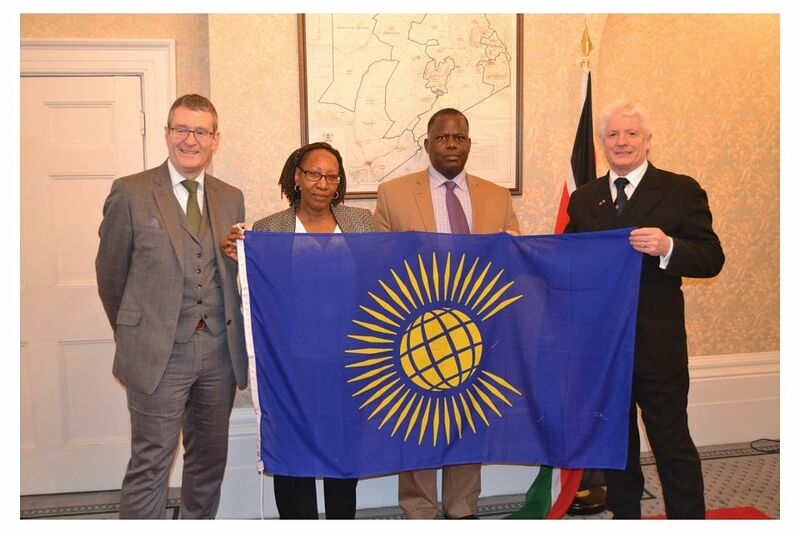 It will unite the countries and entrepreneurs taking part, with flags being raised in Kenya on Monday 13 March, Commonwealth Day, as part of a shared celebration across the globe, which will also see many local UK authorities raise their own Commonwealth flags at 10.00am. Nwes Special Projects Manager, Caron Lemmer says. The team behind the Commonwealth Entrepreneur Development Project would like to hear from other organisations who are interested in supporting the project. For more information about the project and how you can get involved, please contact us.